Blogging from the road (late at night), please excuse errors and sound quality issues etc.). Press the orange play icon on sound files to hear audio. 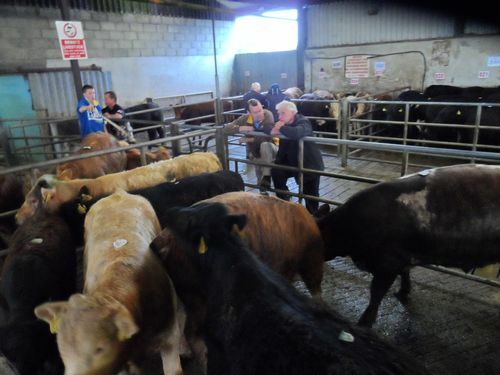 I expected to be at the ancient pilgrimage mountain ‘the reek’ (or Croagh Patrick) today but instead ended up at a cattle and sheep mart. You really never know where you end up when you go with the flow! An early ferry back to ‘Ireland’ and goodbye again to beautiful Inishbofin. 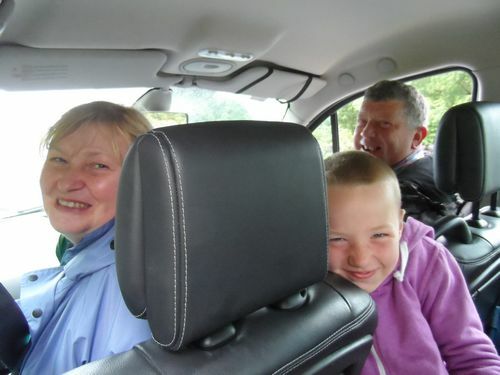 I got a lift with Damien Dempsey’s Cork friends Tony, Martina and their grandson and the craic was so good in the car that I completely forgot what road I was supposed to get off at. I finally woke up to the fact that I was supposed to be going in a completely different direction and finally hopped out in Maam Cross. Several days on the road and I haven’t even left County Galway! Not looking good for the other 31 counties but they do say west is best. Still, I’ll need to get my skates on. Maam cross was like going back in time to hardier time when people lived off the land, when men looked like men and where fellas like me with a teddy bear on their backpack get strange looks. 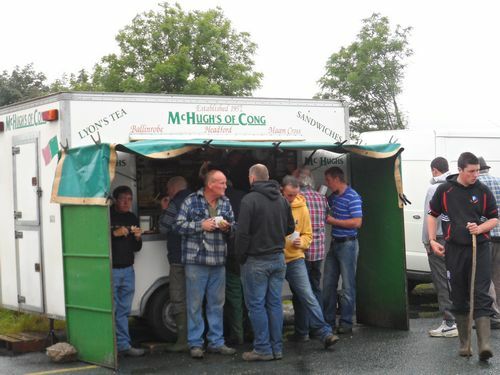 Dozens of hardy looking men gathered around stalls selling chickens, machinery and work clothes while lads mingled and drank tea by the gallon at the side of a chip van. I realised a farmers mart was in full swing across the road and decided to have a gawk. I hadn’t been in a mart in about 25 years or so. They seem to be a thing of the past, a once central meeting point of commerce and community during a time when Irish communities were centred around farming. The mart in my hometown closed a long time ago and the closest I’ve been since is Tesco, or maybe a local butcher now and then. 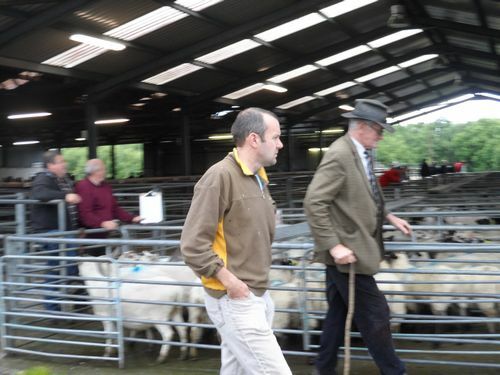 Inside was another world of sheep, cows and shrewd looking farmers ready to seal deals as buyers or sellers. I chanced my arm straight away and approached an older man to ask him for his views for my project. Not a chance. ‘Oh you’d be much better talking to one of the men inside’. So in I went. I hovered around like a rookie, trying to look rural and not like a Dublin RTE guy trying to get the latest. I was aiming for authentic but I didn’t exactly have the man of the land vibe going on. Maybe the beard would help. Eventually I worked up the confidence again. I approached two other men who looked chatty. ‘And what is it for?’. ‘Ah sure the country is fecked’ one said. 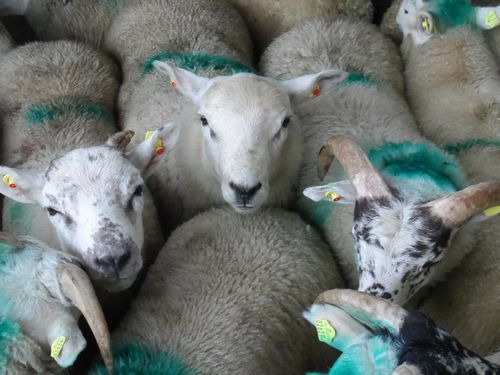 ‘I know that but what is the way forward do you think, from a farming perspective?’ I asked. ‘Ah you’d be much better talking to someone else’. No joy. My confidence falling again. I spotted two teenage lads. Over I went to hover. They were speaking in the Irish language, lads from a world apart from mine. I chanced my arm. ‘Ah you’d be better talking to one of the grown ups’. And again I tried. ‘Excuse me, I’m doing this…’. ‘The country is fucked. It’s gone. It’s over. That’s all I have to say about it’ and off he stormed. Heavy stuff. He certainly made his point. Another man replied ‘does the solution have to be peaceful?’ and then walked off. Point made again. I wandered around for another bit. I couldn’t help get distracted by the sounds of the animals. Were they screaming in distress? Surely not, ‘they’re just animal sounds’ I thought. But I looked closer. I looked into the eyes of sheep and cows and saw them manoeuvre around in panic, knowing they were on the next leg of a death bound journey. There was no doubt, they were suffering. I didn’t want to go there. I’m a meat eater. I’ve never really connected with the animal rights thing except in theory but this was real. Food for thought. Inside the main pen area was like a parallel universe. An MC man rapped out the credentials of various animals who wandered around frightened in a mini stadium of buyers and sellers. It was an auction house afterall and it reminded me of auction house or horse racing commentary, high paced action that was beyond my simple understanding. I chanced my arm with a few photos but started to feel disrespectful, an urban tourist ‘taking’ from a raw real world of hard work. I got out of there. Outside I chanced another man. ‘Ah no thanks. I’m not good at that sort of thing’. Was it a case of farmers not trusting others, of being private shrewd movers, or was it me and my amateur tactics? Or could it be that they are simply not comfortable expressing themselves into a recording device or articulating a vision for Ireland beyond stating everything that is wrong? I didn’t know. As I started to pack up my bag and consider defeat I looked up and saw a chatty man on a mobile phone. He finished up his call and I told him what I was at. ‘We need a revolution’ he said. ‘Can I record you?’ I asked. 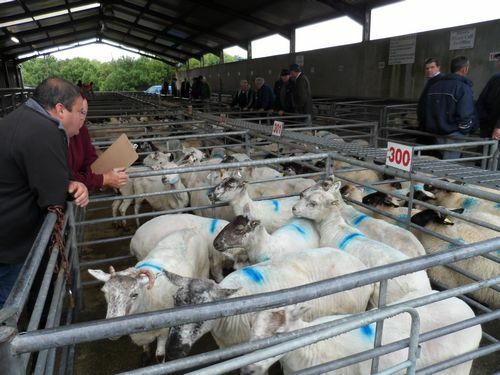 And so began a fairly hard hitting commentary on the seriousness of what farmers are facing, the true hardship and suffering, the anger they are feeling with the power brokers, and a real feeling that we have sold out to Brussels, making the last free Irish men a thing of the past. No more fishing, farming, hunting, working the bog. He regretted leaving England and would encourage his kids and all kids to emigrate. He won’t be voting Fine Gael, nor Fianna Fail, nor anybody again. He has no faith in the system. He said England was a place that valued the working man, that didn’t sell out its own. After we finished the recording he told me about a farmer who had a visit from the inspector and afterwards went out and shot his 60 cattle and them himself. He told me of another 32 year old man who killed himself and said the suffering is real and all around him. I wanted positivity but I was not going to force it. If this was life then so be it. However it was when I got a bit more personal and asked him what he did to keep himself together that he lit up. He came alive with passion and a smile came over his face. ‘Music, I play music’. He talked with pure joy about playing the concertina, about the amazing spirit of traditional music, the friendship and craic. Culture I thought, was a refuge from it all, connecting with something beyond mind, money and politics. Music takes us to the soul, the place the politicians can’t get you. As I was heading out a younger farmer who I’d said hello to earlier approached me. The 37 year old was there selling the last of his brother’s animals. He had sold all his earlier in the year, as well as his jeep and other machinery. He had moved back in with his mother and had split with his partner over money issues. All his peers were gone, there was no more work as a stone mason, and he couldn’t emigrate because of his love for his children, the older of whom is already talking about emigration. I asked him how he copes. ‘Anti depressants’ he told me. I asked him where he got his hope ‘It sounds corny but from my young child’. He talked about having protested the Iraq war while working in Canada, and the need for Irish people to come together. His interview is really worth a listen. He was a strong fit good looking fella with the world at his finger tips but he was trapped in a land that doesn’t allow him anything to work for each day. 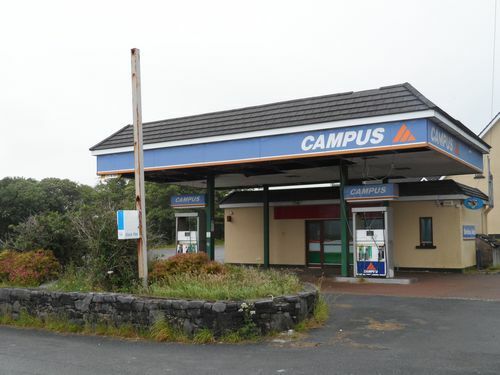 ‘You’re better on the dole’ he said, and described the isolation and depression that is everywhere in Connemara. I wanted to help him. I wanted to do something for him but I could see this lad was tough. He was a survivor and I hoped fortunes would change for him. I spent the next couple of hours in a cafe nearby tapping into their wifi, catching up on some emails and processing the hard hitting experience of the mart. I was upset and moved by what I had heard. I felt helpless. I got on the road again in the afternoon. The weather was miserable but I had heard reports the rest of the country was basking in sun. 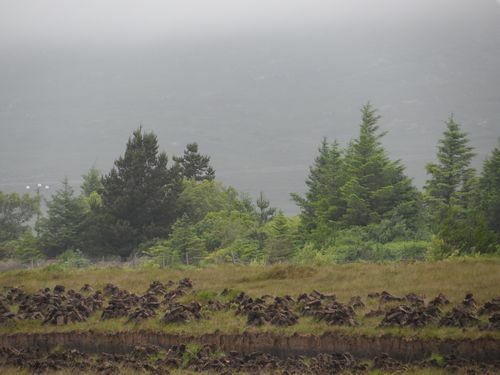 More suffering for Connemara. An hour later and no lift. I decided to backtrack towards Clifden, the way I should have gone earlier that morning. If I had have gone the right way then I wouldn’t have been at that mart. More than often chance is something that is bringing you where you need to be. I crossed the road and within minutes chance gave me my next interview. 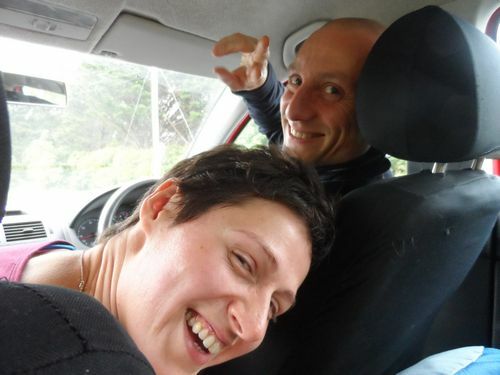 Two Polish people who are living in Galway and on their way out camping with friends whilst trying to grapple with the weather despite 7 years of practice. ‘I wouldn’t have anything to say about politics and things’ the girl insisted. The guy was driving and a bit quieter. I didn’t believe her. I wanted a Polish perspective. I chanced an interview. ‘Ok but I don’t have much to say’. ‘Everybody does’ I said. She explained she was a psychologist who worked with people with special needs and how she doesn’t engage with politics, media or current affairs because it’s harsh, aggressive and negative and that ‘you have to mind yourself’. The interview wasn’t going to deep but then ended with a cracker that defied any notion that she had nothing to say. She described her own philosophy as based on the native American myth of the two wolves. In this myth a grandfather tells his grandson of the two wolves that fight inside our minds and souls. One is filled with evil, anger, sorrow, regret, greed, self pity and false pride. The other is good, joyful, loving, peaceful, humble, kind and full of faith. The grandfather described that the fight between these wolves goes on inside us all and that the wolf that will win is the one we feed. 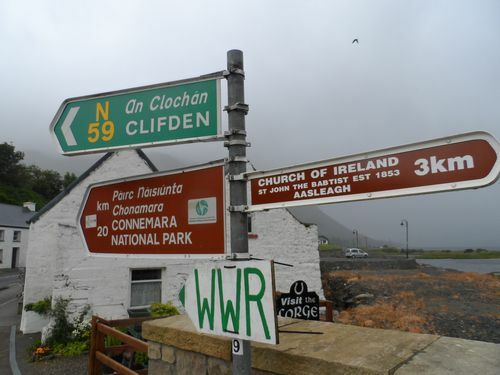 Twenty minutes in the rain until my next lift and I got to Leenane with a lovely Cork couple holidaying in Ireland for their first time in years and loving it. 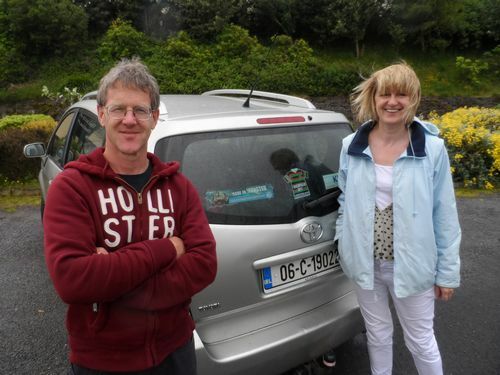 They were happy to have their photo taken when they dropped me off but insisted on the Cork registration plate being in it. You gotta hand it to Cork people and their pride of place! 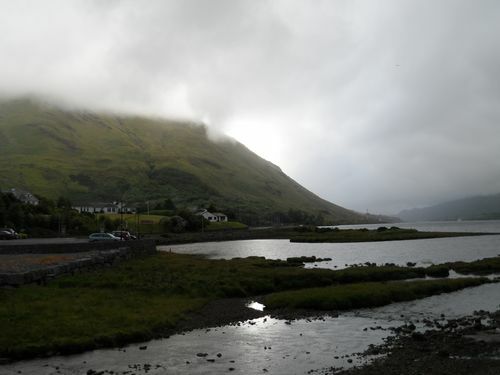 In the beautiful village of Leenane on the Mayo-Galway border I started hitching towards Westport. I had been offered a couch via Facebook but hadn’t replied because I wasn’t sure where I would end up. I wasn’t sure where I was going to sleep but decided to let the evening decide. An old drunk farmer said he’d give me a lift later (maybe when he drank more!) and then Susan called me for a chat. I told her I’d call her back in 5 minutes when I crossed over to the local pub and got a cup of tea. The 5 minutes was to drift into another time zone. In the pub I sat down and an older northern man asked me if I was walking the western way. I told him I was going around the long way. 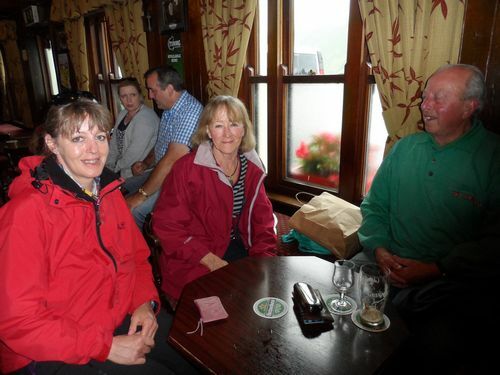 We got chatting and before long half the pub was engaged in my hitching for hope tour. The local character decided to hold court on it all but I wasn’t having it. I ended up having a great one hour with Edward (79), his wife Helen and their daughter Linda. It turns out Edward was a senior figure in the banking world and during the troubles he had been one of Northern Ireland’s most successful business men. He explained how the greed of the banking world had cost him the bulk of his life’s savings and his children’s inheritance and why regulation is needed to prevent greed in all it’s forms. He talked about the great hope he had for the north and his belief that the border shouldn’t necessarily exist. He credited his apparent health to the love and support of a loving wife, hill walking, Guinness, his involvement in cricket and rugby, and his faith in God. He said people without a spirituality are like a stool with three legs. Before he left (and off the record) he told me an incredible story worthy of a documentary of film, about how upholding his principles has cost him dearly in life. We parted as friends and promised to stay in touch. Off I went to Westport. After twenty minutes hitching, and enjoying the time in the open air, I got picked up by a butcher from Westport who lived in Clifden. 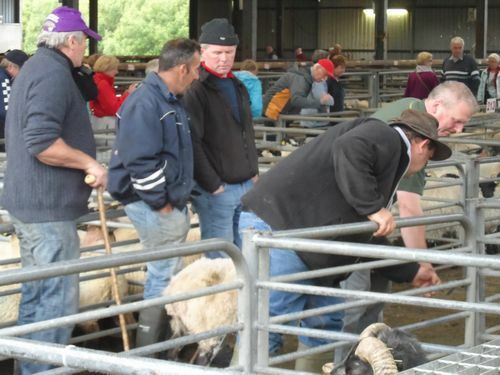 This being Ireland where everyone is connected, it turns out it was the same butcher I had seen Adrian HerlihIy visit in Clifden the day before. In Westport I wandered around looking for a bed for the night. After half an hour walking it appeared everywhere was booked out. I eventually found a bed and breakfast, caught up on some online work, and hit the hay, ready for more hitching for hope in Mayo. I was particularly moved by my conversations with the 37 year old farmer and the 79 year old ex banker. Their humanity really touched me and gave me hope but I can’t shake the despair I encountered at that farmer’s mart, the real feeling of abandonment that an old way of life is being destroyed by short sighted policy makers. Ultimately though my day uncovered hope through love, through music, through the principles and ethics, and through faith. I am grateful for the four lifts I received, and the generosity of people sharing their stories. There is much to process. The hitching and hope continues. 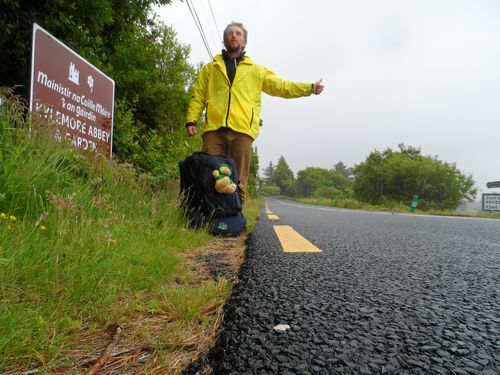 ← July 5 – Goodbye Inishbofin, hello again Inishbofin, and it’s all Damien Dempey’s fault!